Every woman knows there is a multitude of reasons why you may feel impatient, agitated, or generally irritable throughout the ups and downs of day-to-day life. But did you know that there are some specific phases during which these emotions are more probable? Throughout the various processes of the reproductive system - periods, pregnancy, and menopause - the body's levels of hormones fluctuate. Specifically, the presence of estrogen and progesterone will rise and fall; this will have repercussions on the activity of the chemicals in the brain, which in turn affects mood. This is a very common condition that causes a range of potential symptoms, including breast pain, bloating, mood swings, and irritability. Studies have shown that PMS is most common among women when they are between their late twenties and early forties, and it can actually stop 1 in 20 women from continuing in their daily lives. It is most likely to occur around 7 - 14 days before the first day of your period due to the specific activity of hormones at this time. You may notice that you feel more sensitive at this stage, which can make your more tearful and generally irritable. PMDD is a less common condition, which has similar symptoms to PMS, but to a more serious degree. In some cases, it can be so severe that it interrupts a woman's working life or causes the breakdown of relationships. PMDD is specifically associated with drastic mood swings. It can cause irritability, impatience, and agitation to an unwarranted magnitude, which can be frustrating, especially when the moment has passed and you become acutely aware of having responded in a way that is disproportionate the circumstance. If you feel that you may be experiencing this disorder, you should talk to your doctor as soon as possible. Pregnancy and motherhood can be an emotional rollercoaster at times, causing a wealth of different emotions to manifest themselves throughout. Many women - especially during their 20s and 30s - get pregnant. If this is the case, it is important to discuss what happens throughout pregnancy with a health professional so that you can be thoroughly aware of the changes that will happen - both physically and psychologically. Pregnancy commonly causes feelings of irritability and agitation. There are not just external factors that influence women - the choices they make for health and well-being play a vital part as well. During the menopause transition, hormonal fluctuations can cause cramps, breast pain, and irritability. In addition, natural hormonal changes - as well as certain lifestyle and medical factors - can trigger irritability, among other symptoms. Even though most women experience menopause in their forties or fifties, a few may experience it in their thirties or even before. Generally, a woman has to deal with many lifestyle changes that are challenging and stressful, particularly during her twenties and thirties. Whether these have to do with relationships, career, children, or other factors, in conjunction with the processes taking place in the reproductive system, feeling anxious or irritable is natural and even likely. 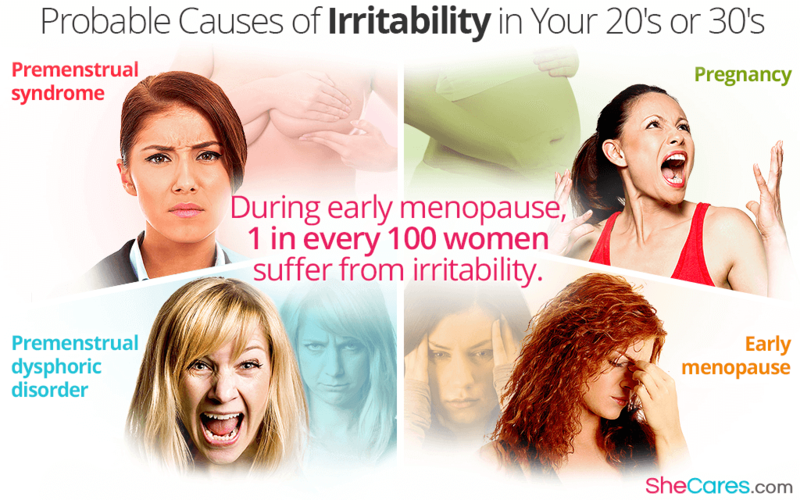 For more about irritability and how to treat it with lifestyle changes and natural remedies here.